The suggestion is that a majority of Caudill’s votes were at least in part votes against Hale. Wilkes gained 563 votes, while Hale gained only 287. 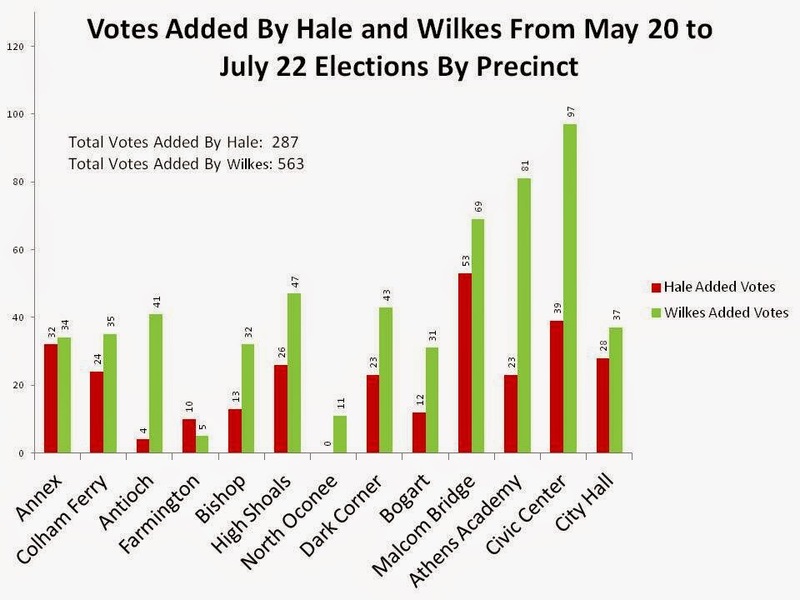 Hale gained more votes than Wilkes in only one precinct. Wilkes went from 37.6 percent of the vote in the May 20 first round to 51.2 percent in the runoff. His name will appear alone on the November ballot, since no Democrat has filed, meaning Wilkes will return to the Board of Commissioners in January after a 10 year absence. Wilkes spent nearly four times as much money on his campaign as did Hale, an analysis of campaign finance statements showed. Wilkes invested heavily in the time after the May 20 primary on newspaper advertisements, those records indicated. Neither candidate claims to having done any door-to-door soliciting during that period, relying instead on telephone calls to voters. Wilkes told me he targeted Caudill’s voters in those calls. Caudill told me that she did not endorse either candidate in the runoff. “I said nothing,” Caudill told me in a telephone conversation on July 25. Robert Wyatt, active in local Oconee County Democratic Party affairs, said neither he nor his wife, Ann Stoneburner, also active in Democratic circles, endorsed either Hale or Wilkes in the runoff. Both had actively worked for Caudill in the May 20 race. Wilkes ran extremely strongly in Colham Ferry, his home precinct and also the home precinct of BOC Chairman Melvin Davis, and in Antioch precinct, to the south of Colham Ferry. Wilkes also had the majority of the vote in those two precincts in the May 20 race. He added 35 votes in Colham Ferry and 41 in Antioch by July 22, winning 64.1 percent of the votes in the former and 69.2 percent in the latter. 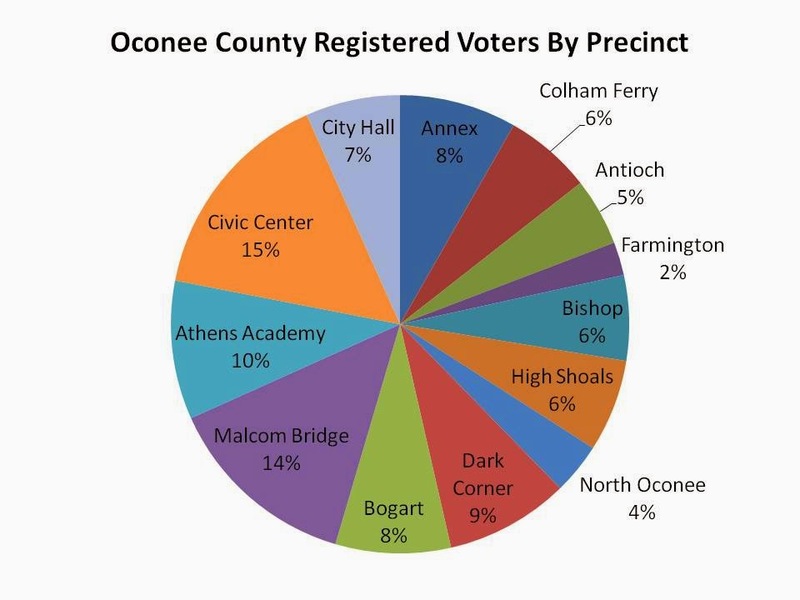 Oconee County’s precincts are not equally-sized, and Hale kept the race close–she lost only by 105 votes--by carrying the large precincts of Malcom Bridge and Athens Academy. 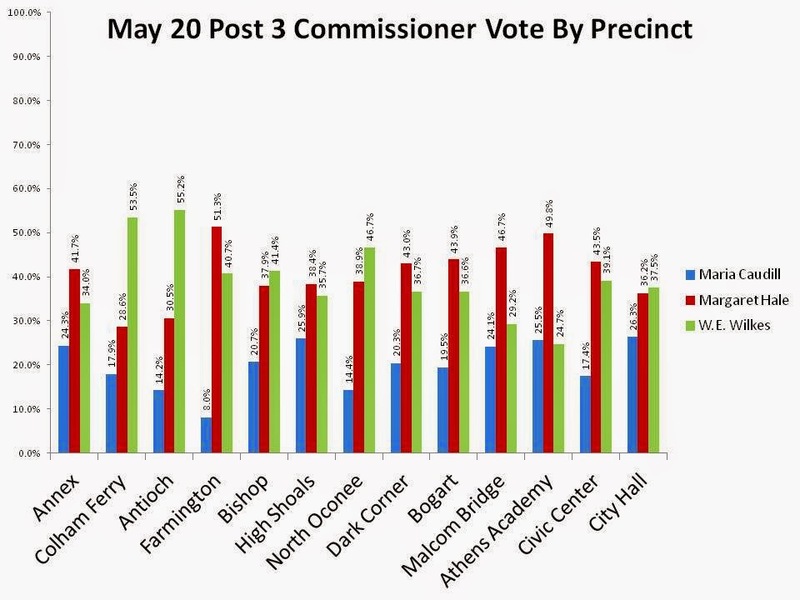 She also carried the Annex precinct, Bogart, Dark Corner and Farmington, her home precinct and the county’s smallest. Wilkes carried the largest precinct, Civic Center, by 51.6 percent to 48.4 percent, or close to the 51.2 percent to 48.8 percent overall county split. Wilkes said, in his conversations with voters, he didn’t discern any issue that was on people’s minds. He said he didn’t think people were particularly concerned about the issue of the power of Commission Chairman Melvin Davis and he didn’t think the support of Chairman Davis played much of a role. Wilkes’ biggest campaign contributor, according to his contribution disclosure reports, was Larry Benson, owner of Benson Bakery in Bogart and chairman of Davis’ re-election campaign in 2004. Henry Hibbs, former Oconee County Extension Agent and someone who worked closely with Davis both when Davis was in extension services and since he became BOC chairman in 2000, endorsed Wilkes in one of Wilkes’ full-page campaign advertisements in The Oconee Enterprise. Franklin Shumate, another close associate of Davis over the years, was Wilkes’ representative at the Board of Elections and Registration as votes were being tallied on July 22. Davis and Shumate monitored the election returns together at the elections office that evening. Hale said one issue voters told her they are concerned about is the upcoming Special Purpose Local Option Sales Tax referendum, on the ballot in November. “In all the years I’ve been doing this, this SPLOST seemed to have more negative feedback than what I have ever received before,” she said when I talked to her by telephone on July 28. Wilkes, in the campaign, called for a strong BOC chairman, while Hale focused on the need for a strong Commission. Hale said she felt that Davis’ behind-the-scenes support of Wilkes made a lot of difference, but it was not the only thing that worked against her. “Bubber has a lot of family in the county, a lot of older people, and they get out and vote,” she said. An examination of the voter records shows that 22 people named Wilkes are registered to vote in the county. “We just didn’t get enough people out to vote,” Hale said. With the data released to date, it isn’t possible to know how many of those who voted in May came back to the polls on July 22. It is likely that some who voted in May didn’t return to the polls, and that some who missed the May 20 election did vote. One group that could not vote in the July 22 Republican Party primary runoff was those 533 voters, 10.4 percent of those who voted, who participated in the Democratic Primary in May. 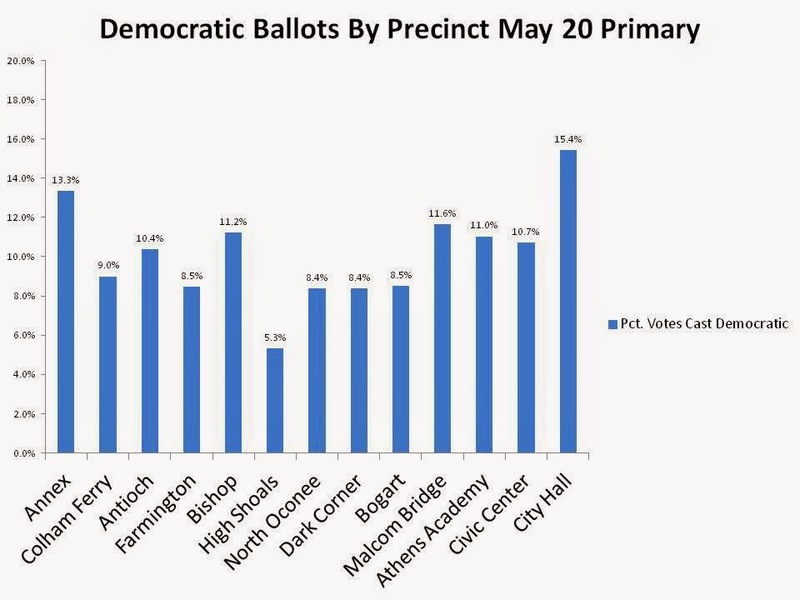 The most “Democratic” precinct was City Hall, with 15.4 percent of the voters asking for the Democratic ballot, and the least Democratic was High Shoals, with 5.3 percent. Overall turnout was 23.4 percent in May, and 20.9 in July. 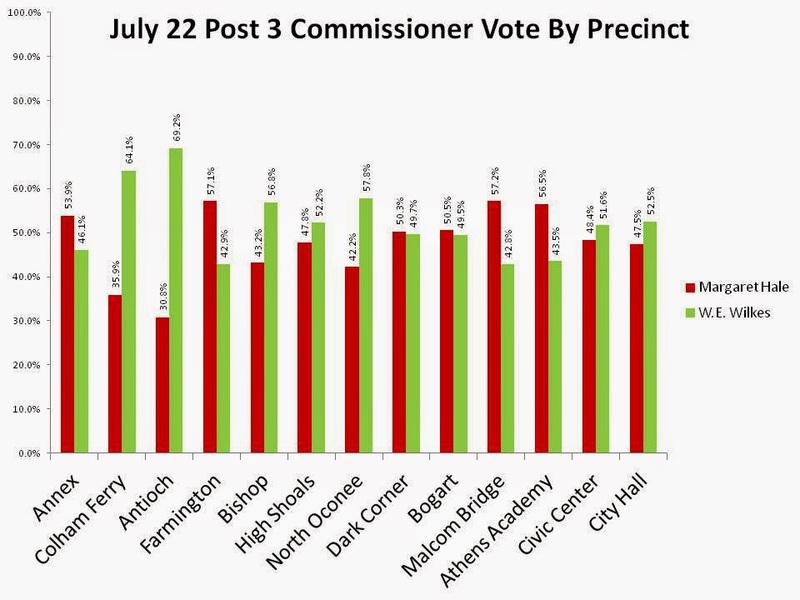 Not all of those voting on the Republican ballot in either election voted in the Post 3 contest.